Huntsville, AL, March 26, 2018 – Summit 7 Systems, a Microsoft Managed Partner, is now one of only four official resellers for Office 365 GCC and GCC High licensing for companies and agencies of less than 500 employees. Microsoft previously required organizations to sign an Enterprise Agreement (EA) for 500 or more licenses to access the Office 365 GCC High environment, but with this new program Summit 7 Systems can provide licensing to smaller companies, which is a critical step in continuing to secure the data held by the Defense Industrial Base. The availability of Office 365 GCC High licensing for companies of less than 500 employees is a significant development for the Government and DoD Contractor market. It is particularly critical for Defense Contractors who must comply with the DFARS 252.204-7012 clause and are looking to move from Office 365 Commercial into the fully DFARS capable Office 365 GCC High environment to help them close out their Plan of Actions and Milestones (POA&M). Partners like Summit 7 Systems make Microsoft products and services come to life. Together, we empower everyone to achieve more with modern workplace solutions designed specifically for the US Government agencies and Federal Contractors that support those agencies. With mobile productivity and secure collaboration technology from Microsoft and enablement services from partners like Summit 7 Systems, organizations in even the most highly regulated industries can operate like the most agile enterprise organization. 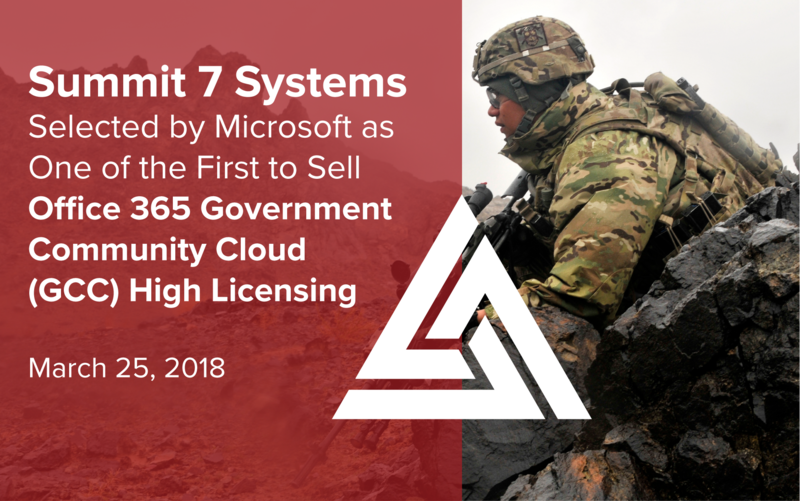 Summit 7 Systems (S7S) is a Microsoft Cloud Solution Provider and Microsoft Gold Cloud Productivity Partner headquartered in Huntsville, Alabama, and proud to serve DoD and Federal contractors all over the world. Summit 7 is helping organizations find "a new way work" with cutting edge cloud technologies through thoughtful leadership, technical expertise and compliant platforms. Our methodologies are applied to some of the most intricate governance and compliance requirements around the globe - specializing in Microsoft Azure, Office 365, SharePoint, Exchange, Skype for Business, Microsoft Teams, and Nintex. After nearly a decade of transforming organizations and their data - the S7S team has completed hundreds of successful projects for clients, from Qatar to Tacoma, WA. This experience and industry leadership has culminated in 8 Microsoft Press book releases by Summit 7 employees and 11 Microsoft MVP awards. S7S is now one of the go-to firms for Security and Compliance related topics in the Microsoft Partner Network, and regularly speaks at Microsoft Government Cloud focused industry events.